Vote For Cake - Misc. In celebration of Elvis' 75th Birthday, fans will gather at Graceland for the Official Elvis Presley Day Proclamation and Ceremony. The ceremony will take place on the front lawn of Graceland on January 8 and will include special guests Priscilla Presley, Memphis Mayor AC Wharton, Memphis City and Shelby County representatives and Elvis fans from around the world. The Elvis Birthday Proclamation Ceremony will end with the cutting of Elvis’ 75th birthday cake. EPE is asking fans to participate in choosing the cake that will be part of Elvis' 75th birthday ceremony. 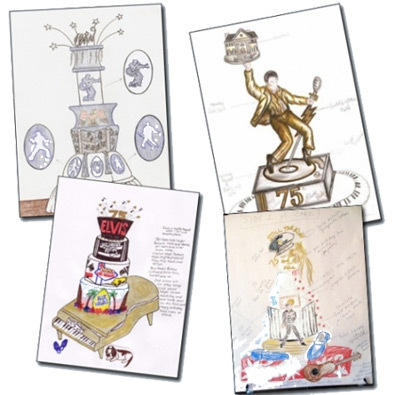 Graceland has received Elvis-inspired 75th birthday cake designs from four master cakemakers for you to choose from. The winner of the online contest will create the cake for the January 8th Elvis Birthday Proclamation Ceremony. You can vote for your favorite cake design once a day by using the form at the bottom of the page. The contest runs December 7 - 14, 2009. I'll take a piece of cake. I prefer the corner piece with lots gobbly gook icing on it. I'm not picky on the artwork. Just save me a piece. Holy crap - things are bad. Ridiculous! Elvis is about music not cakes! Because of things like these Elvis fans have the reputation they have! Hey,who wants "On Tour" when we can have a fu...ing cake! Oh so it's not just me that thinks those cakes are ugly. I could have voted for the last one if they had left the policeman's cap off the top! I don't give a s**t about the cake but can I vote for "Elvis On Tour" on DVD/Blu-ray instead? This is a joke, right? But where is the duck?